Stocks are on an election high this month, shaking off the worst of October's dizzying losses. That euphoria could be short-lived, according to Lakshman Achuthan, co-founder of Economic Cycle Research Institute. He says one particular chart illustrates the high risk of another wave of selling. "We're focused on cycles, the direction of economic growth," Achuthan told CNBC's "Trading Nation" on Wednesday. "What we see, and we've seen this for quite some time, is that whenever you have a deceleration in growth, you're going to get some impacts in the equity markets." During periods of slower growth in 2010, 2012, and 2015 to early 2016, for example, the S&P 500 experienced a sharp downturn, says Achuthan. "In the post-GFC [global financial crisis] environment, the way that that manifests is that you see a higher risk of a market correction," he said. The S&P 500 has already entered and rebounded from correction territory twice this year on worries over peak earnings and economic growth. A more than 10 percent drop from 52-week highs marks a correction. In February, the S&P 500 tumbled 12 percent from its then-record high of late January. During the worst of the October sell-offs, the S&P 500 was down more than 11 percent from its most recent record set in September. 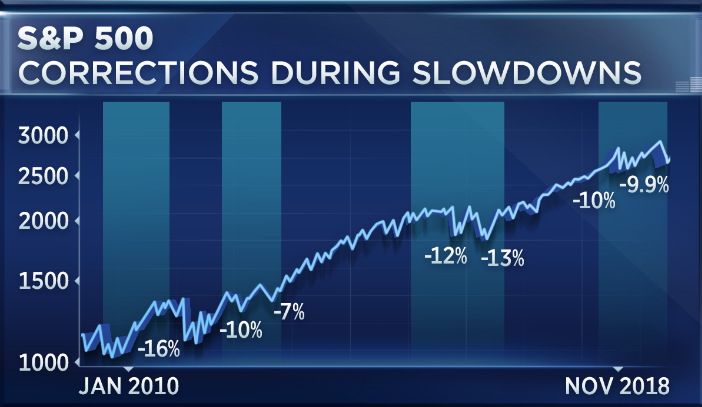 "The question is, is the slowdown over?" asked Achuthan. "Is the deceleration in economic growth ending? And since the answer to that is no, the leading indicators still show some weakness in front of us, the risk of another correction remains. It's that simple." While Achuthan says gross domestic product and unemployment figures suggest a roaring economy, a deeper dive into economic data backs up his view of a weakening expansion. "There's something called gross domestic income, and it's just as valid as GDP, and the growth rate there peaked a year ago and has been decelerating," he said. "It's not a recession, very, very clear. But it is a deceleration. We've had three of them already since the last recession. This is the fourth one." Achuthan says if trends persist, the risk of the S&P 500 falling another 10 percent to 20 percent from current levels remains high. The higher end of that range would translate to a drop to levels not seen since the beginning of 2017.